Teething is no fun for your baby, or for anyone else nearby. Most kids experience at least some discomfort a few days before a tooth breaks through the gum. For many, those pre-eruption days are marked by runny noses, loose stools, a low-grade fever, and some general crankiness. Fortunately, most babies respond quickly to Teething by Liddell. Children under 12 should take one spray under the tongue three times per day or, if preferred, spray once into an ounce of water or juice and have the child drink the liquid. For infants and children under five years of age, please contact us to request a free dropper. 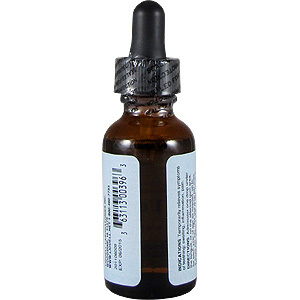 If a dropper is used, administer one drop for each year of age under the tongue three times per day. As an example, a child of three would take three drops under the tongue three times per day. Also, a child under one year of age should take one drop three times per day. 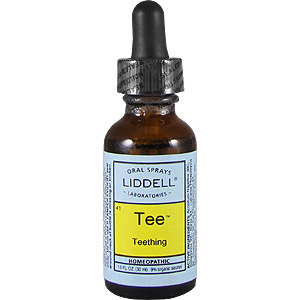 Teething is a combination of remedies carefully designed to alleviate immediate symptoms and to work at a deeper level, helping to promote proper tooth development and reduce pain. Give your baby lots of extra cuddles and attention when he is teething. Gently massage the swollen gums with one of your clean fingers. Give a clean, gel-filled teething ring, cooled in the fridge to relieve his tingling gums. Do not place the ring in the freezer or dip it in honey. Use a barrier cream on his chin, to help prevent soreness from continual dribbling. Try regular sips of cooled, pure water. A simple remedy that brings quick relief to a baby is to rub lemon juice on the gums. This acts as an astringent to irritated gum tissue and brings relief. Babies don't mind the sour taste as their taste buds are not sufficiently developed for it to be a problem. You can also cut a wedge of lemon and give that to baby to chew on. Avoid salty or acid foods. Teething is shipped in a discrete, unmarked package. Orders are processed immediately and usually take about 3 to 5 working days to be received. We do ask that you try it for 2 to 3 weeks to feel the full effects. Any information received is used only for order processing and shipping purposes. Your information, such as e-mail address, will never be disclosed to a third party.